The world of classic ballet, which runs on a set of rigid strictures, encourages and affirms an almost unattainable, incredibly unhealthy body ideal, and has been one of the last artistic fields to racially diversify, isn’t exactly what you’d think of as a safe haven for socially-conscious dancers looking to make their voices heard. 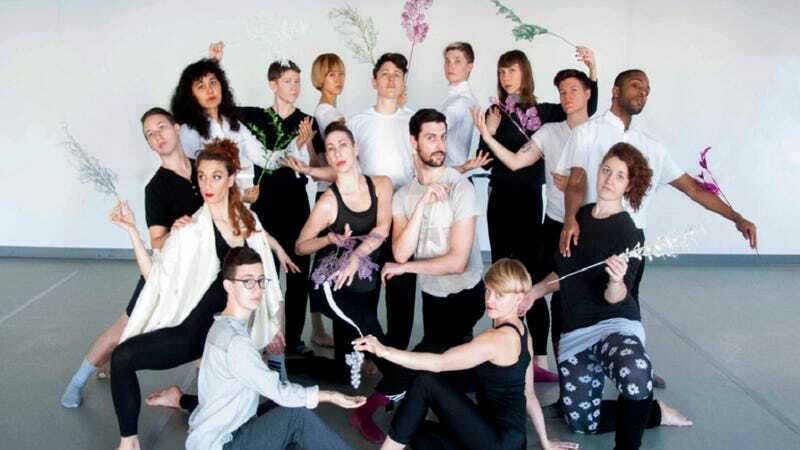 But that’s exactly what a New York City-based queer dance troupe is doing—by turning two separate classical ballets into one artistic expression of LGBT activism. Founded in 2011 by dancers Katy Pyle and Jules Skloot, Ballez is a dance collective dedicated to promoting the visibility of the lesbian, gay, bisexual, and trans communities through a traditional but approachable medium. Their latest project, a mashup of Russian composer Peter Ilyich Tchaikovsky’s The Sleeping Beauty and Beauty and the Beast, takes both stories out of the realm of fairy tales and places them in a concrete historical context. Ballez’s Sleeping Beauty and the Beast puts audiences in the garment factories and union halls of the Lower East Side at the turn of the 20th century, as well as in 1990's New York City during the end of the AIDS epidemic, creating a timeline of the LGBT community’s eventual politicization. The impetus for Sleeping Beauty and the Beast began long before Ballez was a reality, according to Pyle, who is directing the show. In an email response to Jezebel, the co-founder and artistic director of the company explained the origin of the troupe’s latest endeavor, which began when she saw a traveling tour of the ballet as an 11-year-old in her hometown of Austin, Texas. The transformation had an arresting affect on Pyle. While the Sleeping Beauty and the Beast was largely shaped by Pyle, Skloot made a major contribution to the show’s second part that helped recast it in its final version. During a residency in which the duo worked on their first collaborative effort, a ballet called The Firebird, a Ballez, Skloot brought along a book of queer and lesbian fairy tales, which inspired the Beast portion of their next project. In the end, the ultimate message of Skloot and Pyle’s dance troupe is that of inclusivity. “In this time of such extremism and hateful separation and bigotry, I want to give queer, trans and straight audiences alike, a moment to truly witness the incredible, beautiful human beings whose stories deserve remembrance and canonization, and these performers who deserve joyful witnessing,” Pyle said.